Talk about the need for comfort foods…..it continues here in the Northeast where forecasters are predicting more snow. A blizzard at sea they’re saying with howling winds and snow along the eastern seaboard and islands. Oh, no!! Is this an early April Fool’s Day joke?? Luckily I found this recipe to try and keep us warm. It is just a little different from my usual way of making chili. It uses ground turkey and includes macaroni, making a hearty, filling, family-friendly meal with enough to freeze for another meal if you want to. You can crank up the heat with ground red pepper, or keep it mild if there are sensitive palates at your dinner table. Departing from my usual -make half a recipe- I made the whole amount with the intent of freezing half of it. This works well for a future meal when you are in a hurry. If you do plan to freeze part of it, be sure that the container you use fits in the freezer and also what you’ll be using to reheat it. You can also use a zip-lock bag and lay it flat in the freezer so it will stack nicely with other contents of the freezer. Include the name of the dish, date made and frozen, and instructions for reheating. Ideally use within 2 months to avoid freezer burn. To reheat, first thaw somewhat in the microwave until its pliable, then pour into a baking dish and bake for about 30 minutes to reheat. Melt some grated cheddar cheese on top for a “just made” look that no-one would suspect had been frozen. 1. Preheat oven to 350*F. Spray a 2-quart baking dish with non-stick cooking spray and set aside. 2. Cook pasta in boiling water until almost al dente. Drain. Combine pasta with beans in a large bowl. 3. While pasta is cooking, heat a large skillet over medium heat. Add oil to pan and swirl to coat. Add onion, pepper, garlic and mushrooms. Cook for about 8-10 minutes or until liquid almost evaporates. Add to bowl with pasta and beans. Add turkey, cook for 5 minutes or until done, stirring to crumble. Cook the turkey, stirring to crumble. Add seasonings. (cumin through ground red pepper); Stir in marinara sauce. Bring to a boil. 4. Add marinara/turkey mixture to pasta and beans, toss to coat. Pour desired amount into prepared baking dish. Top evenly with grated cheddar cheese. 5. Bake at 350*F for 10 minutes or until cheese melts. Freeze the remainder, as described above, for another meal. This morning was very chilly for mid-September, and the prediction is for a cooler than average day. So right away I am thinking about making chili in the slow cooker. I’m always amazed at how quickly I adapt to the next season. Even though I’m not ready to give up all that summer has to offer, one cool morning, and I’m looking for a sweater or jacket and thinking about chili. Go figure! I do know that there’s nothing quite so enticing than walking into the kitchen and taking in the tantalizing aroma of onions, garlic, and chili powder from a big pot of chili bubbling on the stove or in the crock pot. Serving up steaming bowls of chili with all the fixings is fun and warming in the fall especially if you’ve been outdoors at a football game or other event in cool weather. If you have ever worried that chili isn’t good for you, stop worrying now. There are a number of tricks you can do to keep it healthy but still hearty. First, start with a lean meat, like chicken, turkey or lean beef; second add at least 3 cups of fresh vegetables to boost fiber; and third, be selective in your toppings, keeping to low-fat cheese and sour cream, good-fat avocado, and plenty of fresh options like scallions, radishes, jalapeños, onion, and cilantro. This recipe for turkey chili made in the crock pot incorporates all the “tricks” mentioned above. It’s a meal we really enjoy and I like the simplicity of starting it in the morning and having a meal ready to put on the table except for cutting up a few garnishes at the last minute. 1. Cook turkey in a large skillet over medium-high heat, stirring often with wooden spoon to crumble turkey. Cooked and crumbled turkey with seasonings added. Add chopped onions and garlic, cooking till softened. Add contents of seasoning envelope and chicken broth. Cook and stir about 2 minutes. 2. Spoon mixture into a 5 1/2 quart slow cooker; stir in corn, and next 5 ingredients until well blended. Everything mixed together in the crock pot. Cover and cook on LOW for 6 hours. Serve with desired toppings. Hearty, warming, just right on a cool day. At this point in the summer season there is an abundance of zucchini, with many gardeners looking for ways to prepare it, or friends and neighbors to share with. I am fortunate in being a neighbor to a gardener, and he is kind in sharing his over-flow with us. Soooo, zucchini is on the menu! I spent some time on a recent afternoon browsing through cookbooks looking for some different ways to prepare it. I had a secondary reason to look at recipes; my husband and I are starting a low-carbohydrate eating plan, and so low-carb. recipes was the second objective. Zucchini fits the bill on this count: low calorie and low carbohydrate. I reasoned that by stuffing it with a meat mixture, I could maintain that low carbohydrate profile. 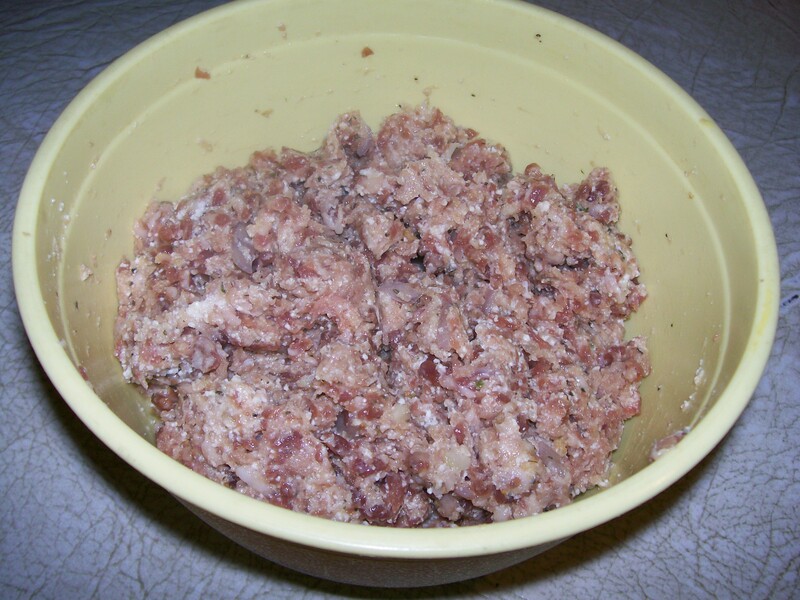 My search turned up a recipe for meatballs using Italian sausage and ground pork. Since I did not have any ground pork readily available, I substituted ground turkey instead and paired it with hot Italian sausage. I mixed up the whole recipe which was more than what was needed to stuff my zucchini, so I formed the remainder into meatballs and froze them, ready for another dish in the future. 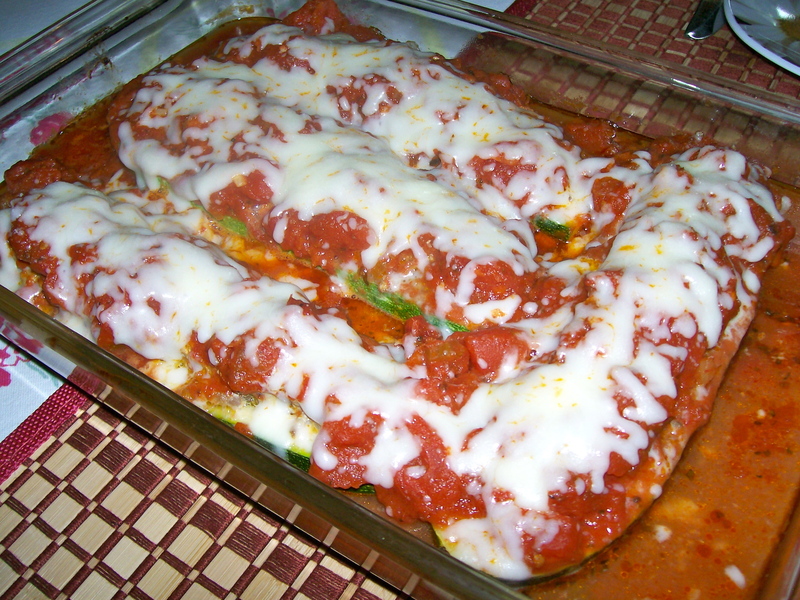 Once I had the zucchini stuffed, I put them into a baking dish, poured some of my fresh tomato marinara sauce over them and baked till the squash was tender. 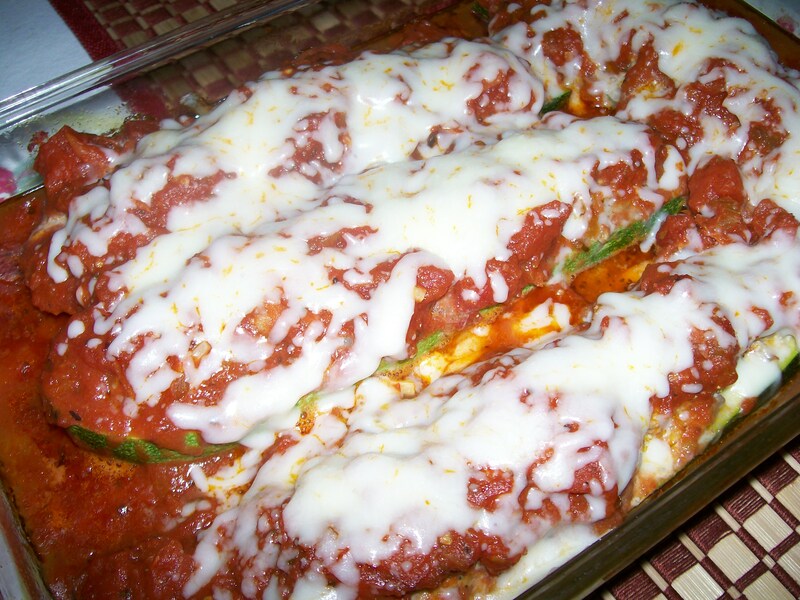 The final step was to sprinkle with mozzarella cheese, let it melt in the hot oven, and serve this dish with a salad. On a more personal note, my motivation for starting a low-carbohydrate diet is obviously to loose a few pounds. I’m clearly not overweight, but there are a few extra bulges here and there, and since I am planning on competing in November in a Ballroom Dance Competition, the time to begin a weight loss program is now when there are so many vegetables available. I have followed a low carbohydrate plan in the past and it has proven to be a good one for me, because once I go a few days without carbs, I no longer have a desire for them and I am perfectly satisfied with all the other foods I can have. After about two weeks of eating like this you can start to add carbs back into your diet slowly, in small amounts so you do not feel totally deprived. My goal is to lose 5 pounds. I’ll keep you posted on how I do. 2 medium sized zucchini, halved lengthwise. (If you use large zucchini, you will need to pre bake them a little in advance of stuffing them. 1. Prepare a shallow baking dish by spraying with non-stick spray. Preheat oven to 350 degrees. Pour a small amount of spaghetti sauce in the baking dish as a base for the zucchini. 2. Heat 1 teaspoon olive oil in a small skillet over medium heat; swirl to coat. 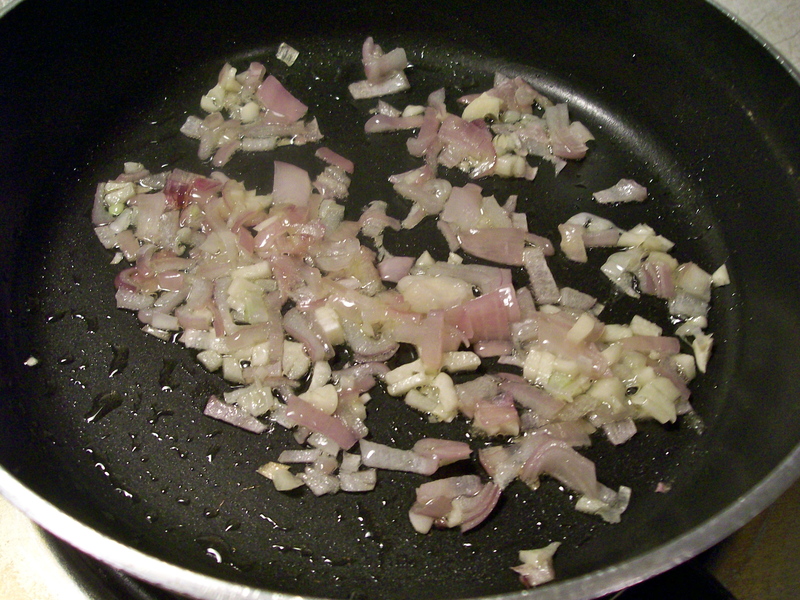 Add garlic and shallots to pan; sauté 3 minutes or until shallots are softened, stirring frequently . 3. Combine shallot mixture, ricotta, and next 8 ingredients (through egg) in a medium bowl. 4. 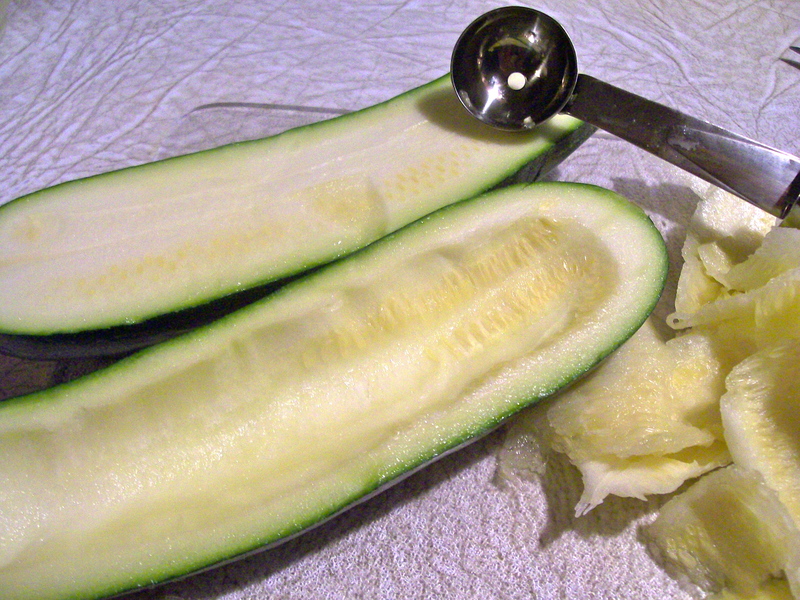 Prepare zucchini for filling by creating a “boat”; i.e., scoop out seeds and some of the flesh. I used a melon-baller, and it was easy to do. Leave enough flesh, so zucchini will support itself, and maintain its shape. 5. Fill each zucchini half with a generous portion of the meat filling. 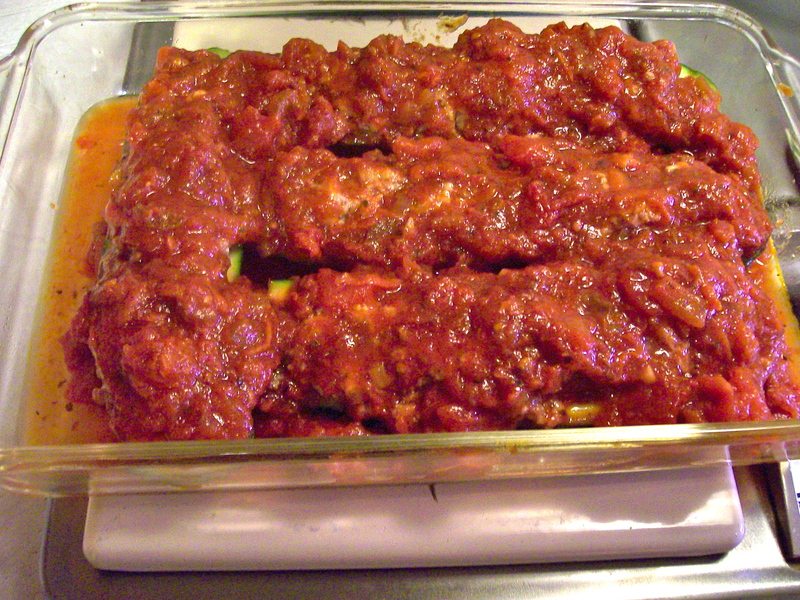 Arrange in baking dish, and pour marinara sauce over the top. If you have extra meat filling, either make more zucchini, or freeze for later use. 6. Cover with foil and bake at 350 degrees for 45-50 minutes. Pierce zucchini for doneness: they should pierce easily and be tender. 7. Remove foil, sprinkle with mozzarella cheese. Return to hot oven just to melt the cheese. I found that the juices from the zucchini and meat added to the volume of sauce, so I think this dish would go well with some pasta to put all that sauce over. If I were eating carbohydrates now, that’s what I would do. 😦 Instead we had this dish with a spinach salad, and it was very satisfying. Happy Father’s Day to all you fathers out there! I imagine many families will be out by the grille this weekend, so here’s a little recipe that can be cooked on the grille, but is not the usual beef burgers. Turkeys are available all year long, but for some reason I only roast one and prepare a turkey dinner at Thanksgiving and maybe Christmas. 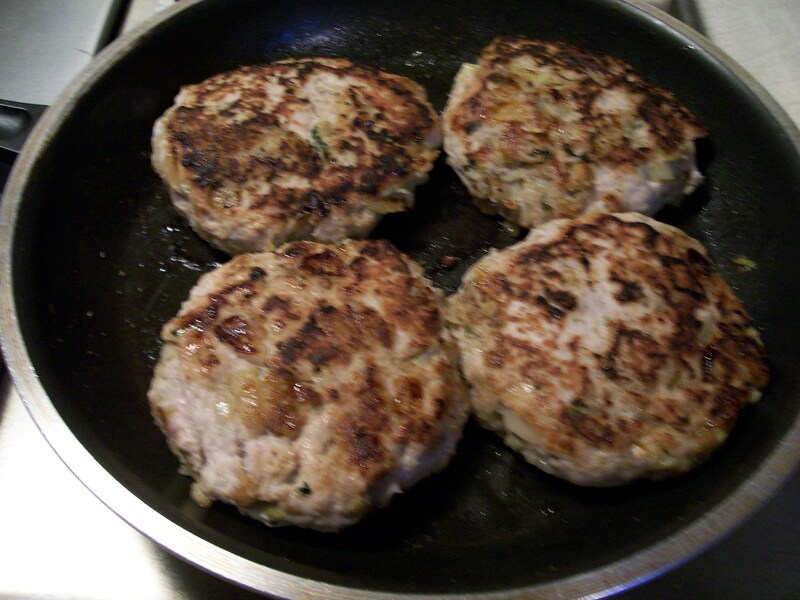 However, at our house, we really like turkey and all the fixings, so when I found this recipe for turkey burgers that include elements of a full turkey dinner I was hooked. Especially at this time of year when cooking beef burgers on the grill is so popular, I suggest you try turkey burgers instead. They are moist and tasty; reminiscent of turkey, stuffing, and cranberry sauce. Not exactly lo-cal, they certainly are more nutritionally dense than a plain ole beef burger on a white bun with catsup. In a non-stick skillet, melt 2 tablespoons butter over medium heat. Add the apple, onion and celery; season with the poultry seasoning , and salt and pepper to taste. Cook, stirring occasionally until the onion is tender, 5-6 minutes. Transfer to a bowl to cool a little. Wipe the skillet clean and return to the stove. Add the turkey and parsley to the apple mixture. 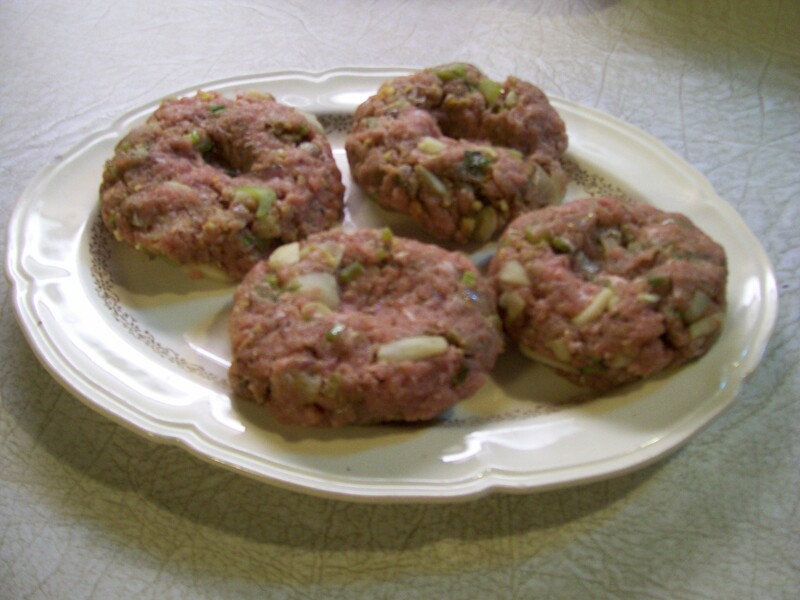 season with more salt and pepper as desired, and combine with a fork; divide into fourths and form into 4 patties. Poke each patty with your finger to make a depression in the center. This keeps them flat as they cook, and not puff up in the center. 3. In the skillet, heat the olive oil over medium heat. Cook the patties for about 6 minutes on each side, lowering the heat the last 3 minutes so they don’t get over-browned. 4. 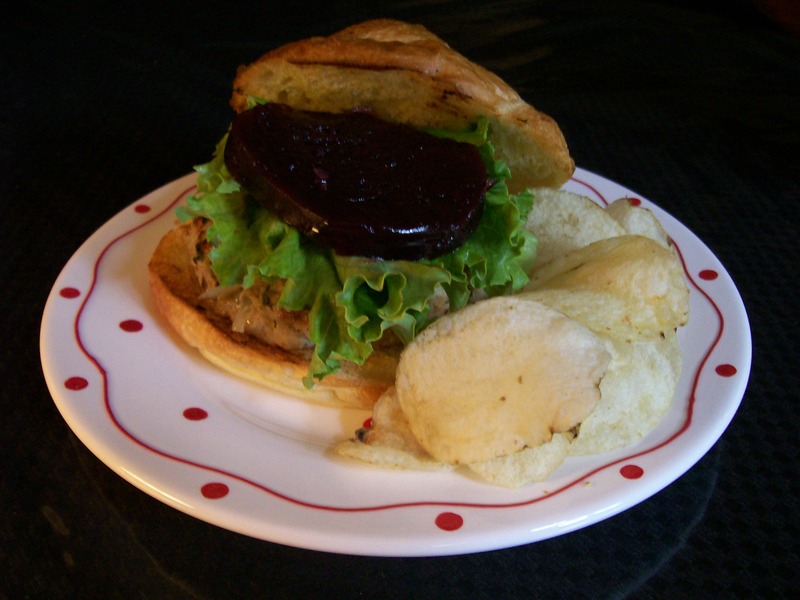 While the burgers cook, open the cranberry sauce, and slice into rounds; lightly toast rolls or English muffins and spread with remaining tablespoon butter. 5. 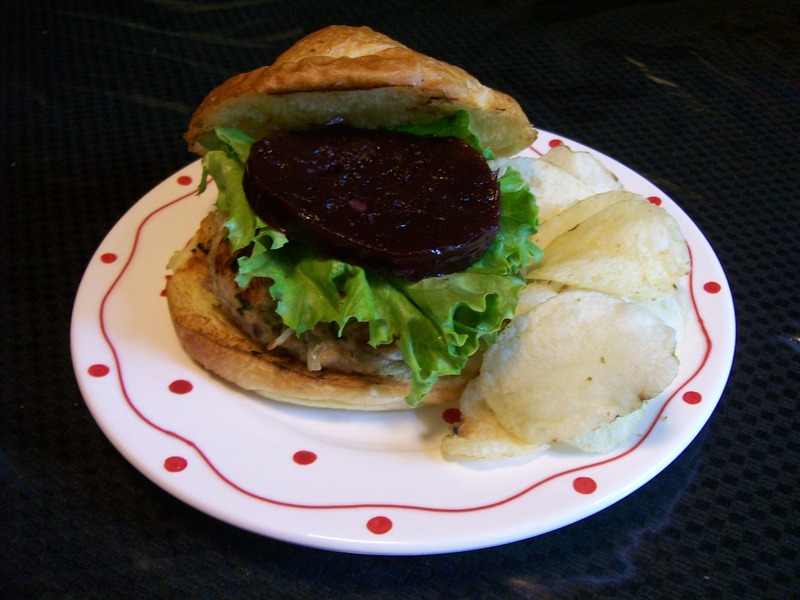 To serve, place burgers on buttered roll bottoms, top with lettuce, cranberry sauce and buttered tops. These burgers may also be cooked on a grill, but use a fine grate so pieces of the burgers do not fall into the fire.